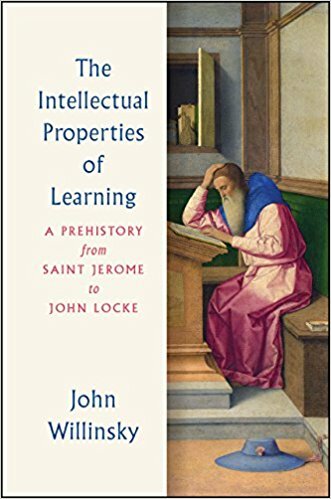 Abstract: Providing a sweeping millennium-plus history of the learned book in the West, John Willinsky puts current debates over intellectual property into context, asking what it is about learning that helped to create the concept even as it gave the products of knowledge a different legal and economic standing than other sorts of property. Willinsky begins with Saint Jerome in the fifth century, then traces the evolution of reading, writing, and editing practices in monasteries, schools, universities, and among independent scholars through the medieval period and into the Renaissance. He delves into the influx of Islamic learning and the rediscovery of classical texts, the dissolution of the monasteries, and the founding of the Bodleian Library before finally arriving at John Locke, whose influential lobbying helped bring about the first copyright law, the Statute of Anne of 1710. Willinsky’s bravura tour through this history shows that learning gave rise to our idea of intellectual property while remaining distinct from, if not wholly uncompromised by, the commercial economy that this concept inspired, making it clear that today’s push for marketable intellectual property threatens the very nature of the quest for learning on which it rests.